This post about Weekend promos for late September 2018 contains affiliate links. Please read this blog’s disclosure post for more info. In a shopping mood this weekend? There are lots of weekend promos for late September to fill your Fall closet! Below are the promos I’m most likely to shop; I’m looking to replenish my work closet especially! How about you? Feel free to use this post for open shopping discussion. ANTHROPOLOGIE || Take 20% off full-price clothing and home this weekend. || Picks: I’m very intrigued by this pink-piped peacoat; this bag has become a closet staple for me; these earrings have an interesting touch of interest. BANANA REPUBLIC || Take 40% off pants, denim and select tops and sweaters. || Picks: These white skinny jeans are stain-resistant and will be great to wear as Winter whites; this tank top looks great under a blazer for work or on its own for date nights (I own it in three colors now! ); this silky sweater has just a hint of cashmere for warmth and structure. FREE PEOPLE || Take 50% off select items. 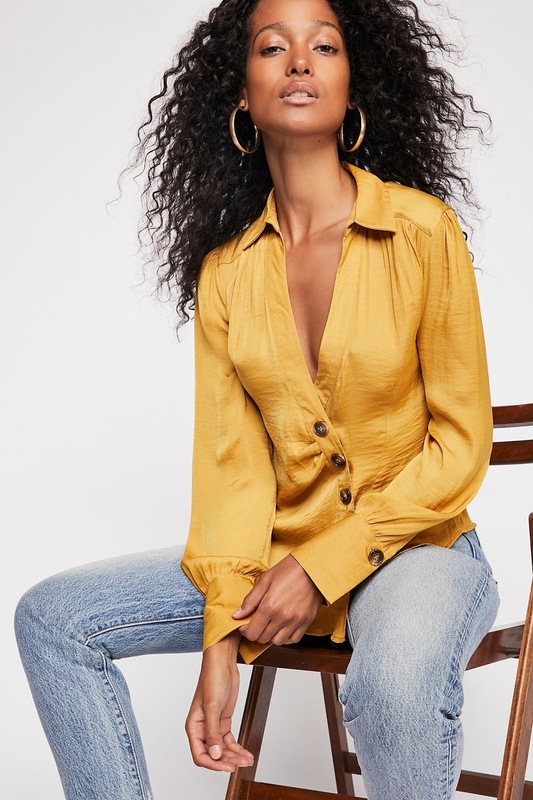 || Picks: I don’t like many 70s-inspired items, but this ribbed top has me smiling; I love a good large-pocket buttondown; the offset buttons on this top are lovely. LOFT || Take 40% off your purchase this weekend. Use code NEWNOW online. || Picks: This jacket is such a great outfit topper, work or casual; I’m enjoying this button-detailed top very much; this necklace looks great with any outfit. MADEWELL || Take 25% off new season essentials, FRIDAY ONLY. Use code HEARTEYES online. || Picks: This tiered chambray top looks great on its own or as a layering piece; I love this wrap top and its cute little bow; these earrings look simple but add a fantastic pop to any outfit. What promos are you shopping this weekend? All prices in the boutique below are before discounts are applied. Next Post Time for one of my favorite events — the Shopbop Event of the Season!! Thought after all this time I'd take a look at where Anthro is at, especially since I suddenly started getting emails again. Oh, my! Check out the "Fringed-Sleeve Sweater" (sorry – I don't know how to add a link)! NO….just NO! STOP already, Anthro!! Plus, there's' just too many offerings online. I spent a lot of time going through the website and it's just too much. I like the look of the peacoat you featured, but it's viscous and poly. I don't think Anthro knows where it's at. So how can I? I think they are far enough away at this point that there's just NO connecting with whatever base they have a possibility of selling to (aka those who can afford them). It's been a long time since I set foot in an Anthro. The website offerings are not tempting me. And I used to visit the closest store (over an hour away) several times a month and spend thousands there. Like someone posted recently, I've realized I'm lucky to have the "old" Anthro treasures in my closet! Wow, who on earth would wear such a thing and for that price? A cave man/woman? Guess her arms will be really warm this Winter. Just who are the buyers for Anthro these days? Anthro, remember who you are. And for the low low price of $495!!! Oh my goodness, thanks for the laugh luvlucytoo! I really hope there are no matching pants…. Egad, terrible…although it does have some natural fibers. I don't think Anthro misses the $1000 or so a month that I used to spend there. Given that most of their old fans have moved on and they are allegedly doing better, I am very interested to know who this stuff is appealing to. The only things that I have bought at Anthro lately is the Sag Habor dress and the San Antonio dress, both of which I really like, but everything else just doesn't appeal. It's my observation that Anthro is trying to do what they think is Runway Fashion Forward. Looking for that customer who is interested in trends and has money. Who doesn't blink at a $500 sweater. I don't think it is true that they are doing better. I think the numbers are manipulated. Other brands of theirs: Free People, Terrain might be doing better but I can't see that the Anthro brand is being embraced by any fashion community. They are milking the season for all it is worth. I have noticed that here, in the very end of September, they are still showing sundresses at full price, with plenty of stock. Nobody's buying that I can tell. The 4 Anthro stores near me are nearly always empty. I almost feel foolish even shopping there now, as if the sales associates know that it's a desperate mission that I'm on. I remember the days when there were lines going into the dressing room and I had to time my visits to avoid the crowds. No worry about that anymore. I think Anthropologie is taking the right steps. I see them paying for more placements on shopping websites and in magazines. They do more partnerships with bloggers now. They seem to be following the J. Crew pattern of a few years ago though and we know how well that worked out! (Aiming for high-fashion, editorial clothing.) Anthropologie has always aimed for the affluent shopper. More of what's happening is our country (and Canada too!) is seeing more polarization between haves and have-nots to the degree that retailers are falling out of touch with upwardly mobile shoppers. I see this in the data all the time, trending over the last three years especially. The NYC stores do seem busy most times that I'm there. Outside of the city I agree — the suburban stores I visit are usually empty.